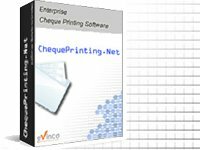 Click the icon to create a new cheque template. A "Cheque Template" window is shown out. Name - Name of the template for reference purpose. Size - The width and height, in mm, of the cheque. Date Format - Different date format is available, like YYYY-MM-DD, YYYY-MON-DD, DD-MM-YYYY, etc. Component - You need to specify the location (bottom and left) and its size (width and height) for different fields in the cheque. If the field is no need, you can assign all zero to make it invisible. Self-Defined Component - To fit special need of some cheque, you can define your own component. You need to provide a name for it. You also need to specify the location (bottom and left) and its size (width and height). You can provide a default value optionally. Click the "Save" button when ready. The new template will be shown in the "Cheque Template List" window.